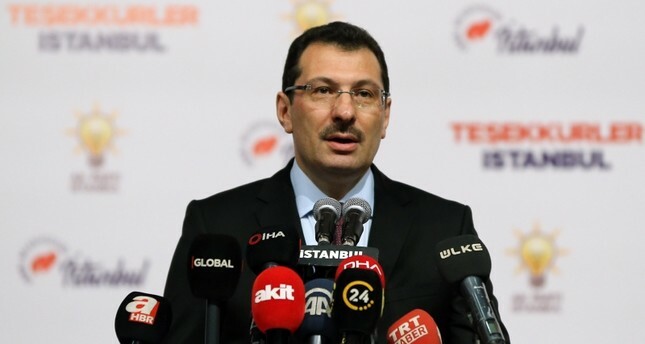 Main Opposition Republican People's Party's (CHP) claim that 93% of the votes have been recounted is false, as only 6% have been counted, Justice and Development Party (AK Party) Deputy Chairman Ali İhsan Yavuz told reporters Monday. Yavuz said the party has gained 5,067 votes from the recount of invalid votes alone. He noted that there are serious irregularities about the recent elections. "The vote difference between the mayoral candidates of the two parties was 29,000 on April 1, and it started falling down to 24,000 on April 2, 21,000 on April 3 and reached 14,000 today," Yavuz said. He continued by noting that the investigation revealed that the registration of 11,186 voters was transferred to Büyükçekmece district. Speaking later in the evening, AK Party's representative in the High Electoral Board (YSK) Recep Özel said the YSK had rejected AK Party's demand for a total recount of votes in 31 of Istanbul's 39 districts, but accepted the recount of 51 ballot boxes. He also said the council had postponed the decision regarding cancellation of elections in Istanbul's Büyükçekmece district to Tuesday. Millions of Turkish voters cast their votes nationwide on March 31 in local elections to choose Turkey's mayors, city council members, neighborhood officials, and members of elder councils for the next five years. According to unofficial results, before any recounts, the CHP's Imamoglu leads Istanbul with 48.79% of the votes, ahead of the AK Party's Yıldırım with 48.51%.